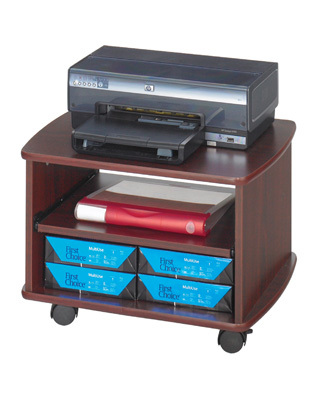 The companion Printer Stand is designed to tuck neatly inside the workstation when not in use. Its 22 1⁄2" x 16 1⁄4" top accommodates ink jet or matrix printers. Features a 17 3⁄4"W x 13 3⁄4"D slide-out shelf, and a 18 3⁄4"W x 16 1⁄4"D x 5 1⁄4"H storage compartment for supplies. Units are mobile on four swivel casters (2 locking). Constructed from furniture grade wood with durable Medium Oak (MO) laminate finish. Assembly required.